C.U.R.E. is a program that promotes the value of having a clean City, raises consciousness of litter habits and improves overall community pride and involvement. Keeping our City clean and well-maintained discourages vandalism, graffiti, littering and crime. On the 3rd Saturday of every month, City of Riverside residents may show their utility bill and dispose of their bulky trash and yard waste for free at the Agua Mansa Transfer Station. As part of its C.U.R.E. campaign, the City hosts periodic bulky item and electronic waste collection events for items too large to fit into residential trash containers. All items are collected free of charge for City residents. 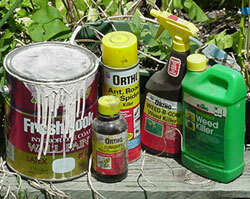 Need to dispose of Household Hazardous Waste? Residents may dispose of household hazardous waste every non-holiday Saturday from 9 am-2 pm at the Agua Mansa Permanent HHW Facility, located at 1780 Agua Mansa Road, Riverside, 92509. For more information about the location of Riverside County HHW facilities, please CLICK HERE. Bulky items, such as refrigerators, washers and dryers, mattresses, couches, furniture, electronic waste and tires. Ward 4 - Grove Community Church Parking Lot - Barton St. at Grove Community Dr. Bulky items, such as refrigerators, washers and dryers, mattresses, couches, furniture, electronic waste, green waste and tires. Bulky items, such as refrigerators, washers and dryers, mattresses, couches, furniture, and tires. *Check out our New Event below...we have new dates for e-waste, bulb/battery disposal & shredding as these items are not accepted at this site on Bulky Items drop off dates. In order to ease congestion at CURE events, we are adding a separate day to collect E-waste, Bulbs/Batteries, and Paper Shredding. Please only bring those items to this event. No household hazardous waste. No commercial business paper shredding. No pallets of paper shredding. No bags, all paper shredding items are to be boxed. Locations vary. CLICK HERE for details. Bring up to five gallons of used motor oil to be recycled and pick up a free container for used oil. 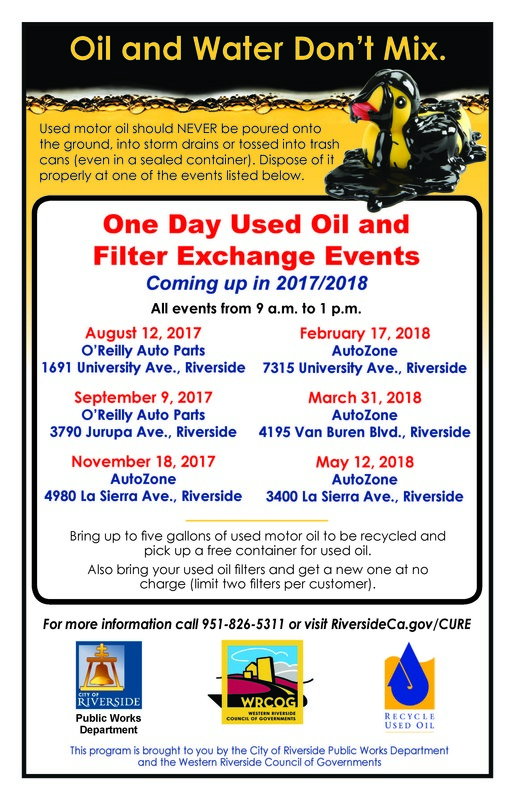 Also bring your used oil filters and get a new one at no charge (limit two filters per customer). All programs are for City of Riverside residents only. Proof of residency is required. Dates are subject to change. Please call 826-5311 to verify details. ALL LOADS MUST BE COVERED TO AVOID FINE!